Simon Pageas Dr. Soren Abramson, Ph.D.
Two prisoners escape through the swamp land in Everglades and the search party is attacked by a giant mutant eel and is considered missing. The Animal Control agent Delmar Coates is searching a missing dog with his ex-wife Sheriff Ruth Gainey-Coates and he discovers the remains of the animal. Meanwhile members of a canoe club organize an expedition through the swamp. When Sheriff Ruth organizes a manhunt to capture the criminals, Delmar informs that his former friend, Dr. Soren Abramson, who is chasing the eel with a group of college students, is the responsible for mutant species. Sheriff Ruth organizes two teams to hunt the prisoners and the eel. Regions are unavailable for this movie. 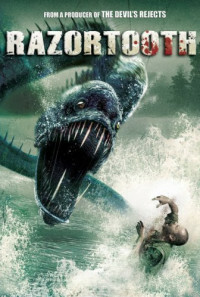 Click the "Watch on Netflix" button to find out if Razortooth is playing in your country.